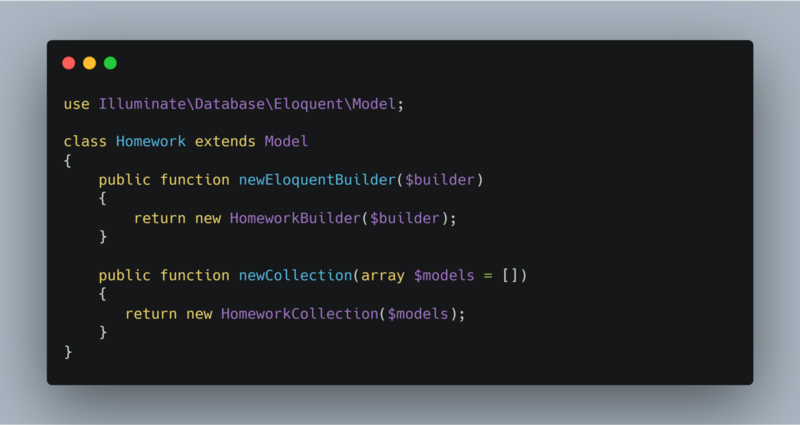 Laravel has a neat way of adding custom builder and collection methods to your models. This is great for a smaller model and cleaner code in your controllers. Create a new class that extends the Eloquent Builder class. Add the newEloquentBuilder function to your model and create a new instance of the builder class you created. Create a new class that extends the Eloquent collection class. Add the newCollection function to your model and create a new instance of the Collection class you created. Note: Even though these functions will do the same thing, it’s good to do as much as possible within your database query (the builder). A where function in a database query will be faster than using where on a collection. Originally published at channingdefoe.com on April 13, 2019. Full Stack Developer. Bay City, MI.